On Saturday the 16th of February to celebrate the birthday of one of the students of La Herradura we went to a typical Uruguayan BBQ, known as an ‘Asado’, organised by some Uruguayan friends of ours. Asados almost always take place on the streets or on the roof of an apartment. Asados are regularly held throughout the summer especially as Uruguay is the largest consumer of beef per capita in the world! 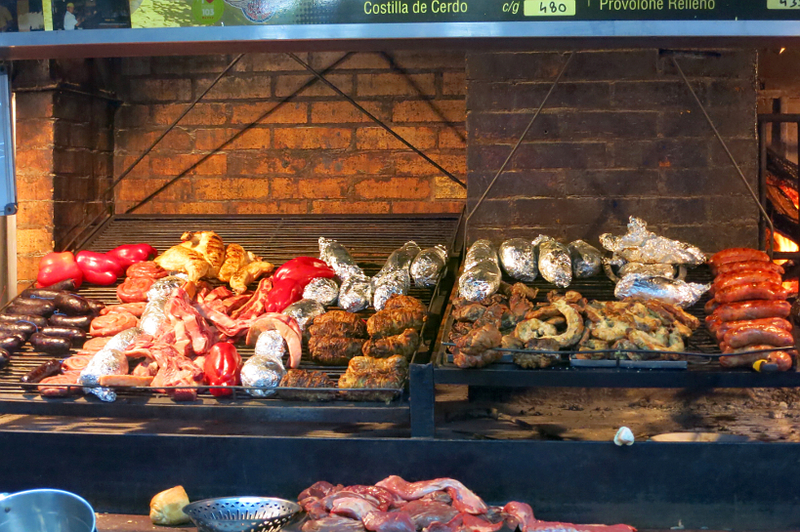 However unlike in Europe the meat in Uruguay is naturally produced and comes almost directly from the animal to the plate. In Europe on the other hand the majority of the meat that we eat is highly processed and includes numerous artificial flavourings and additives to increase the shelf life or enhance the flavour of the meat. El Sabado 16 de Febrero, para festejar el cumpleanos de una de las estudiantes de La Herradura, fuimos a una típica parilla Uruguaya, conocida como “Asado”, que fue organizado por algunos de nuestros amigos. Los asados ​​casi siempre son en las calles o en el techo de un apartamento. Los asados ​​se llevan a cabo regularmente durante todo el verano, especialmente porque Uruguay es el mayor consumidor de carne per cápita en el mundo. Sin embargo, a diferencia de Europa, la carne en Uruguay se produce naturalmente y viene casi directamente del animal al plato. Por otra parte, en Europa, la mayoría de la carne que comemos está altamente procesada e incluye numerosos condimentos y aditivos artificiales para aumentar la vida útil o para mejorar el sabor de la carne. There were various cuts of meat to eat, primarily coming from cows. We feasted on steak, sausages and ribs and even intestine, although the intestine was very chewy and not as flavoursome as the rest of the meat. There were around 10 people there in total and we drank beer and chatted late into the night about various different topics including a comparison of the cultural differences between Uruguay and Europe. Uruguayans are very interested to learn about you if you’re are a foreigner especially if you come from a European country. This is because Uruguay is a small country where everyone knows everyone else. Unlike other places in South America however Uruguay has thus far avoided the plague of mass tourism and therefore it is still an unusual and interesting occurrence when foreigners come to settle in Uruguay. Habia varios cortes de carne para comer, principalmente de la vaca. Comimos bistec, salchichas y costillas y aun intestino (chinchulin), aunque el intestino estaba muy gomoso y no tan saboroso como el resto de la carne. Habia alrededor de 10 personas en total y bebimos cerveza y charlamos hasta altas horas de la noche. Hablamos sobre varias temas inlcuyendo una comparacion de la cultura uruguaya y las culturas de Europa. Los Uruguayos son muy interesados a conocerte si sos un extranjero, especialmente si vienes de Europa. Esto es porque Uruguay es un pais chico donde toda la gente se conoce. A diferencia de otros paises de sud america, Uruguay ha evitado hasta ahora la plaga del turismo de masas y por lo tanto, sigue siendo un caso inusual e interesante cuando los extranjeros vienen a establecerse en Uruguay. Surprisingly, at one point throughout the night, the Uruguayan boy who was hosting the Asado showed us some snacks he had brought back from his trip to Colombia. Unfortunately for us, these snacks, amongst other things, included a couple of packets of fried ants. Although hesitant at first I thought it would at least be worth the experience if i ate one. The only taste however that I was able to make out was of something very salty and char-grilled. It was worth the experience just to be able to say that I had eaten a fried ant however it is not something I would try a second time nor will it become a regularly snack of mine. Sorprendentemente, en un momento de la noche, el niño uruguayo que estaba albergando el Asado nos mostró algunos bocadillos que había traído de su viaje a Colombia. Desafortunadamente para nosotros, estos bocadillos, entre otras cosas, incluían un par de paquetes de hormigas fritas. Aunque vacilante al principio, pensé que al menos valdría la pena la experiencia si comía uno. Sin embargo, el único sabor que pude distinguir fue de algo muy salado y asado a la parrilla. Valió la pena la experiencia solo para poder decir que había comido una hormiga frita, sin embargo, no es algo que probaría una segunda vez ni se convertirá en un bocadillo mío con regularidad. As is usual, the cost of the Asado was split evenly amongst the attendants which worked out at a very reasonable price for the amount of food that we ate. It was definitely an authentic Uruguayan experience for us all! Como es habitual, el costo del Asado se dividió en partes iguales entre los asistentes, lo que resultó en un precio muy razonable por la cantidad de comida que comimos. ¡Definitivamente fue una auténtica experiencia uruguaya para todos nosotros!